France's third largest listed bank Société Générale has cut its profitability target after a market downturn hit its investment and corporate banking unit during the fourth quarter. The bank expects its return on tangible equity to be between 9-10% in 2020, down from a previous target of 11.5%. 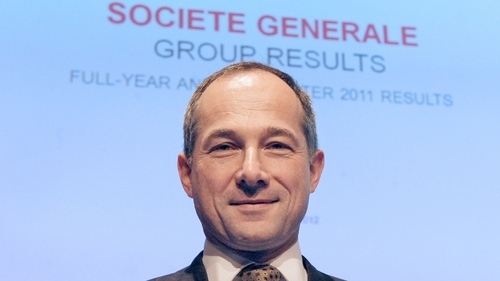 Société Générale also said it would not meet its 3% revenue growth target. The bank cut its forecasts after revenue fell 6.3% in the fourth quarter to €5.93 billion, in line with analyst forecasts collected by Infront Data. The bank had issued a profit warning three weeks ago. The company's corporate and investment banking unit saw its profit fall by more than half during the quarter as a result of a general market downturn. "In a rough environment, most notably at the end of last year, the performance of our market activities was disappointing," SocGen's chief executive Frederic Oudea said. Big European banks such as Société Générale are struggling to find new profit sources after years of rock-bottom interest rates have limited returns in retail banking. Their corporate and investment banking units are also vulnerable to financial market swings. SocGen's cross-town rival BNP Paribas this week also cut its financial targets after reporting its first loss on market activities since the financial crisis, more than a decade ago. Deutsche Bank also posted a bigger-than-expected quarterly loss at its investment bank last week. Following the dismal performance of its market activities, Société Générale - like BNP Paribas- has decided to cut €500m in costs at its corporate and investment banking arm. The bank will also sell or close down some of its businesses. The bank has already closed its proprietary trading desk in Hong Kong. SocGen's CEO also said the macroeconomic outlook has become more challenging for his bank in the past quarter with geopolitical uncertainties, a economic slowdown in the euro zone and lower expected interest rates all having an impact. In order to protect its profitability, the bank will intensify its plan to dispose assets. SocGen now targets selling units handling a total of 6-7% of its total assets, up from 5% until now. SocGen has sold banks in Belgium, Bulgaria, Serbia, Moldova and South Africa over the past few months. The bank still intends to sell divisions that lack critical size on their markets and do not allow synergies with the rest of the group.